Dan Laurin. This double-CD was recorded in 1994. Besides the Telemann Fantasias, it also includes a bonus CD with J.S. Bach’s “Partita for Flute solo in A minor”, BWV 1013 (ca. 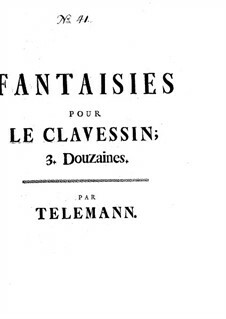 20′, discussed in a separate blog posting).... Telemann's Fantasia No. 4 for Solo Flute is in the key of C major. It starts with a Presto in which the flutist seems to play both the melody and a pedal tone. Telemann Fantasias for Solo Violin Buy from Amazon Back in his own time, even Telemann may not have been aware of his friend’s Sonatas and Partitas, but had he been so he would have surely have been right in expecting his own 12 Fantasias for ‘violino senza basso’ to have wider public appeal.